Welcome back to our second day of First Looks. Today we're looking at the projects Angela and I created for Boutique Borders and Block Party Letters. While we love our cutesy characters and fun scripty sentiments, we also love our essential stamp sets that really tie all our designs together. I'm personally a huge fan of great border and background building sets. If you notice over the last two years, I use patterned paper very minimally. I just like to customize everything myself from start to finish and a great border/background building set will help me do just that. In this card I used the dashed/scalloped combo border. It adds such a cute little touch. I think it's the perfect accent for baby cards or just that boutique feel. Know what I mean? The sentiment here is from Season's Greetings which we'll see more of later this week. And the colors, I'm using our newest Creative Colors in Lemongrass, Apricot, and Rainwater. So, so, so pretty! Now we're moving onto Block Party Letters which we both had a blast using. Sometimes we surprise ourselves too! No seriously, this set has worked much better than we had anticipated, we love how just by changing the colors and placement you can achieve many different styles. Take a look at the fun shaker card Angela created! So clever to hang the letters! 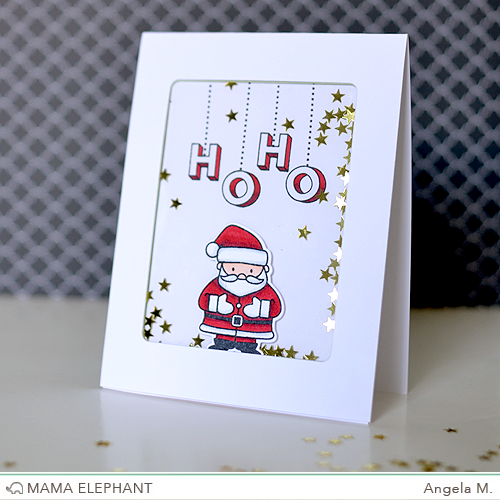 Mr. Santa is from Cozy Christmas stamps and creative cuts. She created the window using the negative cut from one of the dies from Peek a Frame creative cuts. I also used Peek a Frame to create my window card. My card is a fake shaker card, I actually glued the sequins down. The letters were colored with Red Copic makers for the side/shadows and the Wink of Luna Gold marker, which by the way, is incredibly gorgeous. The gold color is just spot on in terms of color and shimmer! The "and Bright" is from Jolly and Merry. New ink colors are so yummy!!! Beautiful cards!! Love the new ink colors, and the new scripty sentiment peek! Well, really, I just love it all! Great cards today to showcase your new products! So much fun! I am so excited about the new Boutique Borders! I can't wait to get my hands on them! I love the new ink colors too. Okay, now I'm REALLY looking forward to this release. Amazing cards. Lovely cards! Love the new borders! The "Season's Greetings" sentiment is awesome, so many things to do with it! Also, the possibilities are endless with the "Block Party Letters" Very excited about this release! These are adorable, can't wait to see the entire new release!!! So fun!! Love the alpha, and those new ink colors are gorgeous!! I'm so excited! These projects showcasing the fab new products are awesome. Fabulous cards! They get me in the spirit to start my Christmas cards! Just love how you can customize these alpha stamps. Love Kryssi's gorgeous non traditional coloured Christmas card. Those borders are lovely.